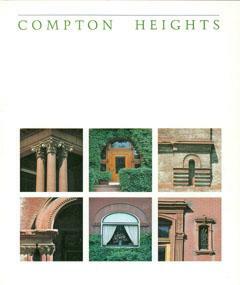 Compton Heights: A History and Architectural Guide (1984) by Carolyn Hewes Toft and Jane Molloy Porter contains an overview from the mid-19thcentury to 1984 along with brief biographies of architects and a survey photo of each house on Hawthorne and Longfellow--an important German-American enclave laid out by surveyor Julius Pitzman. With color plus black & white photos by Robert C. Pettus, the publication won an Art Directors Club award in 1985. Soft cover with foldout map: 90 pages.